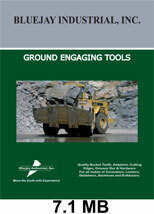 Bluejay Industrial stocks a large inventory of Pro-tuff aftermarket ground engaging products. We stock a large selection of bucket teeth & adapters, pins & retainers to fit excavators, dozers, and graders. In addition to teeth, we also stock popular grader blades along with the mounting plow bolts and nuts. For the cold Pacific Northwest winters, we have grouser retread bar, and pre-cut ice lugs that can be welded to track pads for extra traction.